Need Answers To A Question? Find It Here! Is the provision of the AML and Anti Terrorism Financing Act2001 applicable to 1Stop Gold Sdn Bhd? Yes, the Anti-Money Laundering and Anti Terrorism Financing Act 2001 (Invocation of Part IV) Order 17th April 2008 for dealers in precious metal and precious stones Section 13, paragraph 14(b), subsection 16(2) and section 24 of the Act effective as of 1st July, 2008, requires all dealers of precious metals to report transactions that exceeds a specific threshold amount, is suspicious in nature and there is reasonable grounds the proceeds are generated from an unlawful activity, to the Financial Intelligence Unit in Bank Negara Malaysia without alerting the Customer on the matter. Is trading of gold and silver regulated by any statutory body in Malaysia ? What are the benefits of buying gold from 1Stop Gold ? It is cheaper as the price quoted will follow the international gold price without any additional charges. What are the products available at 1Stop Gold? We are currently offering cast bars in 1 kilo & 500grams that comes with a Certificate of Authenticity. For minted bars, we offer the denominations of 5grams, 10grams, 20grams, 50grams & 100grams which come with an authenticated packaging. Unique jewelleries are also offered in limited quantity and is subjected to small mintages. What is the purity of 1Stop Gold’s products? 1Stop Gold offers gold bars with a purity of 999.9 combined with a series number rom PAMP. The standard and purity of all gold products is guaranteed. How do customers make the payment after confirming the price? Customer Can Make The Payment Through the Payment Gateway Integrated On the Website, Through FPX Transfer. Where can customer collect the gold? Is the gold price offered by 1Stop Gold better than the goldsmiths? Yes. The gold price quoted by 1Stop Gold is pegged to the international gold price market which allows us to be more competitive than goldsmiths. Can I Buy Investment Gold With 1 Stop Gold? Yes. For more information on investment, please click here and contact our customer service. Do 1 Stop Gold Ship To East Malaysia / Duty Free Area? No, We Currently Do not Ship To Sabah,Sarawak, Labuan, Langkawi, Pulau Pangkor Due To Security Issues. Can The Good Be Returned Within 7 Days? Please Read Our Terms & Condition For More Detailed Information – We Only Accepted Return Under The Stated Circumstances. Is 1Stop Gold Authorized To Distribute PAMP Product? 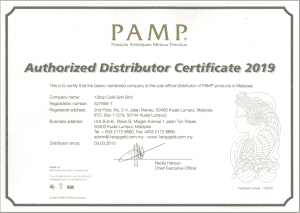 Yes, We Are Authorized Distributor for PAMP Since 2000, for More Information, you May Check Out Here.